The beauty of this recipe for Rustic Italian Bread is that the dough can be made in a bread machine and then baked in the oven – OR it can be made in the traditional way. So, you choose! Unlike typical Italian bread, this bread is very light. It’s called “rustic” but I don’t think the name really fits. It’s more like “light as a feather Italian bread”! Both recipes take 3 hours, 45 minutes – including 1 hour for cooling the bread. But that’s not all “hands on” time. 1 cup water – temperature 100 F to 115 F Here’s a trick, if the water feels slightly warm on your wrist, then it should be fine. You only want it “warm”, not “hot”! Too hot – or too cold and the yeast doesn’t work. Of course, if you’re using a bread machine, it heats the water for you! 3 cups BREAD flour – Interestingly enough – in Canada, they can use ordinary flour. Somehow the flour in Canada is “different”. 2 tsp. sugar – Yeast needs sugar to “work”. Place all ingredients – EXCEPT the cornmeal & egg white – in bread machine according the manufacturer’s directions. Set on “dough” setting. When dough cycle is finished, remove dough and place on lightly floured surface. (I use a dish towel.) Punch dough down – meaning press it down with your hands, which flattens it out. If dough is too sticky, mix in a bit of additional flour before shaping. 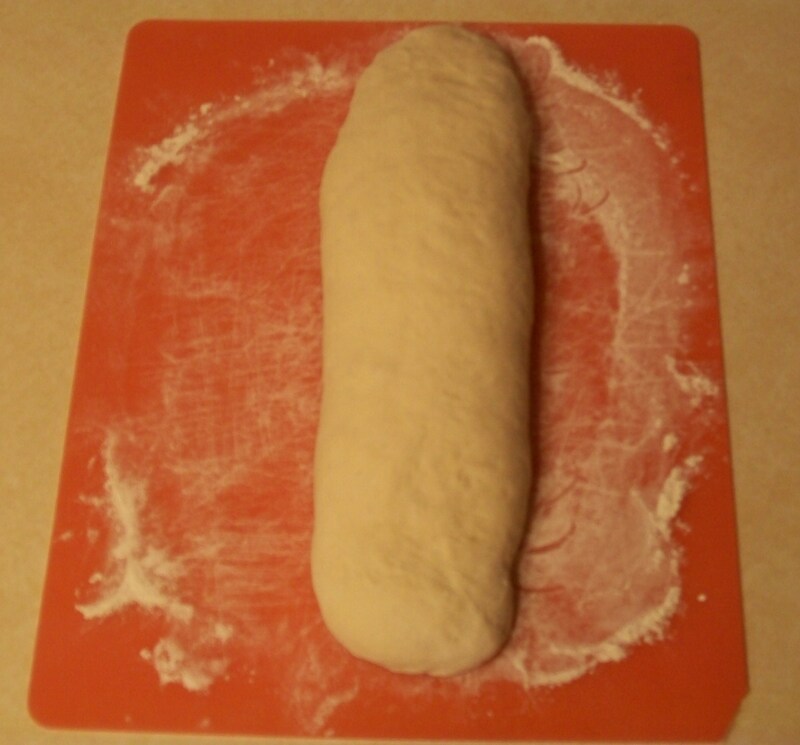 Shape dough into a baguette shape about 12″ long. Prepare a cookie sheet by spreading 3 Tbs. of cornmeal on it. Place formed dough onto cookie sheet. If the baguette shape becomes a bit “messed up”, just pat it back into submission! I find the best way to cook or bake is not to take it too seriously. There’s alot you can do to “fix things” before they’re baked/cooked. And believe me, even wedding cakes can be fixed up – I know ! So don’t freak out – just find a way to fix the problem. I also find that talking to yourself helps immensely ! Now cover your lovely creation and let it rise in a warm place (80 F to 85 F) for 20 to 25 minutes. If your kitchen is cold, you can fill a 13″ x 10″ pan with hot water, place it in the bottom of your oven and let your bread rise in there. I’ve also been known to heat the oven a bit and then shut it off, but you may not want to try that in case you heat the oven too much. Bake for 25 to 34 minutes – or until bread sounds hollow when tapped lightly. I’ve found that bread often cooks faster than the directions say. My bread was ready in 25 minutes, but each oven are different. + Tip – if you like a soft crust, cover the bread with a dish towel as it’s cooling. Enjoy! Lightly spoon flour into measuring cup. Level off with a knife. In a large bowl combine flour, sugar, salt and yeast. Mix well. Add warm water and oil. Mix well. Turn out dough onto lightly floured surface. (I use a dish towel.) Knead dough 10 minutes or until smooth. (To knead dough, push away from you with the palm of your hand, turn dough, fold over and repeat.) If dough is too sticky, add a bit more flour. Place dough into a lightly greased bowl and cover with plastic wrap and a towel. Let rise in warm place for 30 to 40 minutes, or until doubled in size. Punch down the dough, place it back onto the lightly floured surface and cover with inverted bowl. Allow to “rest” for 15 minutes. To form the dough into a baguette and to bake the bread – refer to the directions above, as they’re the same. Enjoy! Previous Post I’m in the Pocono Mountains – and I May Never Come Home! The bread looks golden and fresh. I haven’t baked fresh bread for a long time. Now you make me want to bake some bread. I love fresh bread. 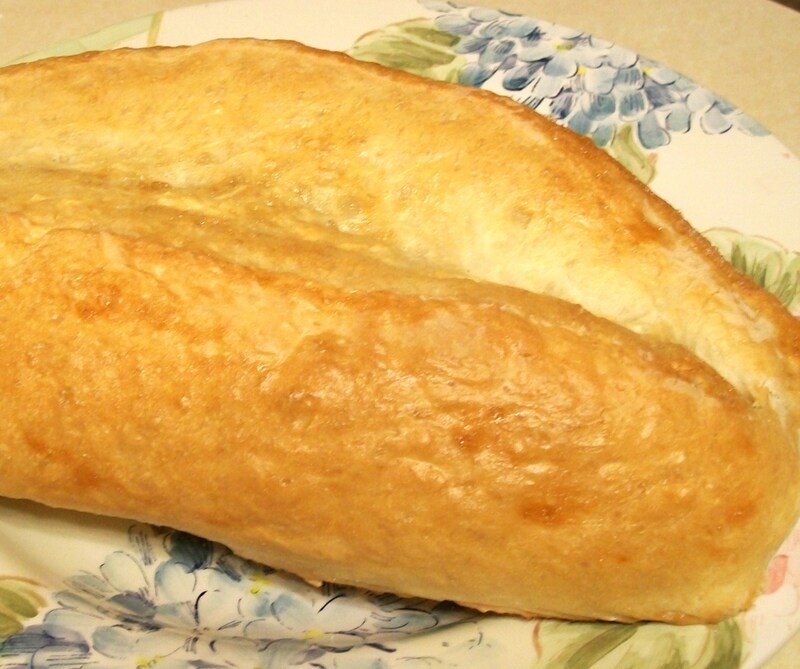 Thanks so much for sharing this Italian bread!